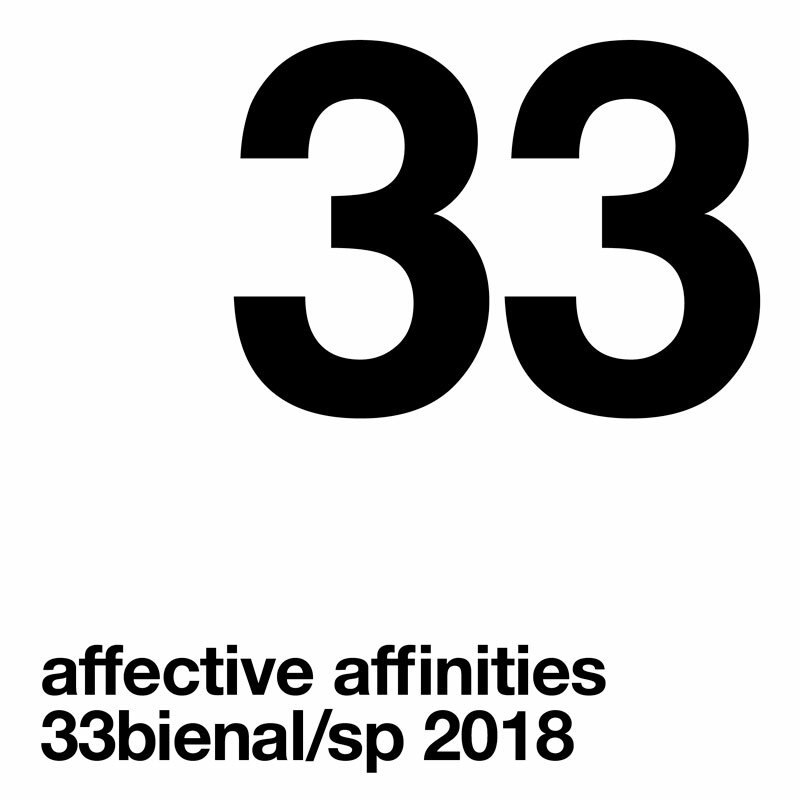 As indicated by the title Affective Affinities – inspired by the novel Elective Affinities (1809), by Johann Wolfgang von Goethe, and by the thesis “On the Affective Nature of Forms in the Work of Art” (1949), by Brazilian critic Mário Pedrosa – the33rd Bienal de São Paulo aims to promote the individual experience of the visitor with the works instead of a pre-determined curatorial narrative. The title does not serve as a thematic straightjacket for the exhibition, but characterizes a way of understanding the exhibition based on associations, and on artistic and cultural affinities among the artists involved. As in Mário Pedrosa’s writings, the proposal is to investigate the ways in which art creates an environment that fosters relations and communication, which moves from the artist to the object and to the observer. Presence, attention and the environment are premises that guide the curatorship of this edition, in reaction to a world of ready-made truths, where the fragmentation of information and inability to focus attention can lead to alienation and passivity. 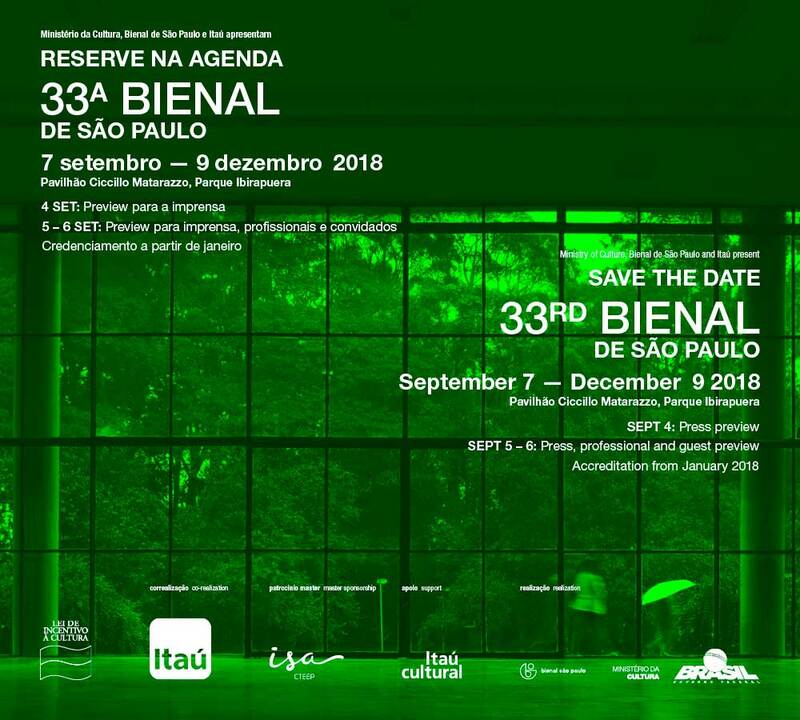 Against this backdrop, the 33rd Bienal de São Paulo will comprise 12 individual projects selected by Gabriel Pérez-Barreiro and seven collective exhibitions conceived by the artist-curators previously announced: Mamma Andersson (Luleå, Sweden, 1962); Antonio Ballester Moreno (Madrid, Spain, 1977); Sofia Borges (Ribeirão Preto, Brazil, 1984); Waltercio Caldas (Rio de Janeiro, Brazil, 1946); Alejandro Cesarco (Montevideo, Uruguay, 1975); Claudia Fontes (Buenos Aires, Argentina, 1964); and Wura-Natasha Ogunji (St. Louis, USA, 1970). Details regarding their curatorial proposals will be provided shortly. The selection by Gabriel Pérez-Barreiro features commissioned projects by eight artists (Alejandro Corujeira, Luiza Crosman, Nelson Felix, Tamar Guimarães, Maria Laet, Denise Milan, Vânia Mignone, and Bruno Moreschi), an iconic series by Siron Franco based on the 1987 radioactive accident in Goiania, and posthumous tributes to three artists: Aníbal López (Guatemala), Feliciano Centurión (Paraguay) and Lucia Nogueira (Brazil). The artists selected for posthumous tributes represent important aspects of the art of the 1990s, a transformational moment for Latin America. 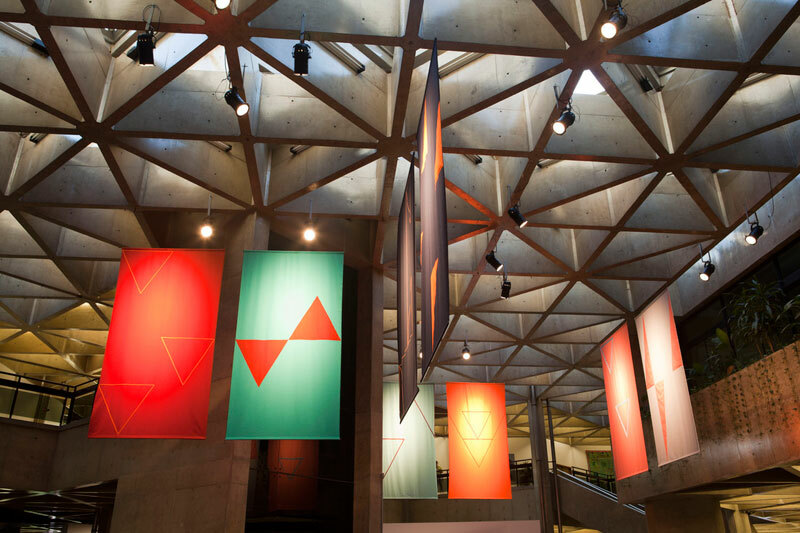 “This was the first Latin American generation to create art free from the oppression of totalitarian regimes of the previous decades,” explains Pérez-Barreiro. Artists of this generation no longer had to make works that were codified or hidden from censorship, and instead place greater emphasis on the expression of subjectivity as a deeply political act. 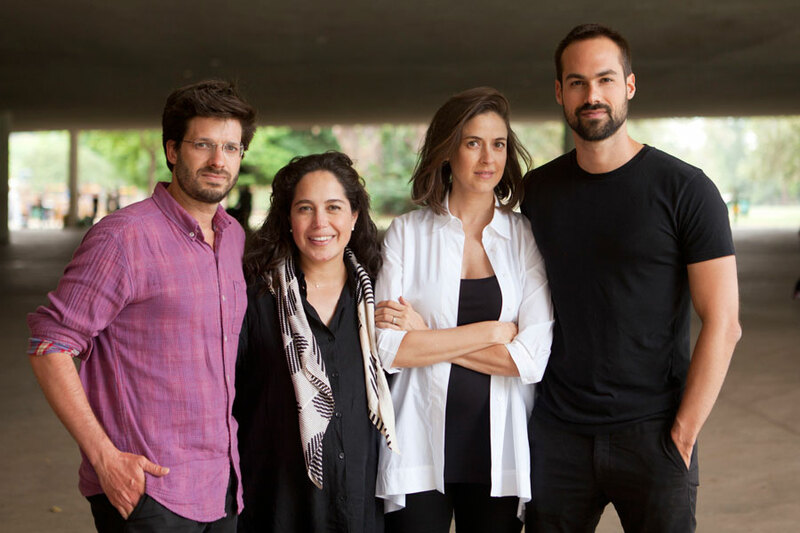 According to Pérez-Barreiro, the tribute to these three artists, with around 30 to 40 works highlighting their careers, was a way of rethinking the Bienal de São Paulo's Historical Nuclei, which were a characteristic feature of the Bienal up to its 26th edition (2004). “I wanted artists that were historical, but not necessarily famous, in other words, that these nuclei were not just a reiteration of names we are already familiar with. 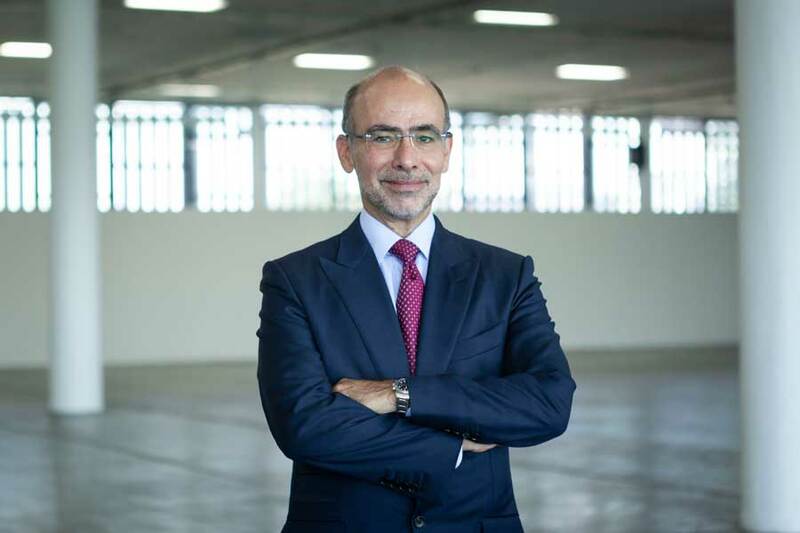 The artists honored are not well known in Latin America, but they are important exponents of their generation, so bringing them to the Bienal is a way of rescuing them from disappearing from the history of art, and showing them to new generations,” says Pérez-Barreiro. 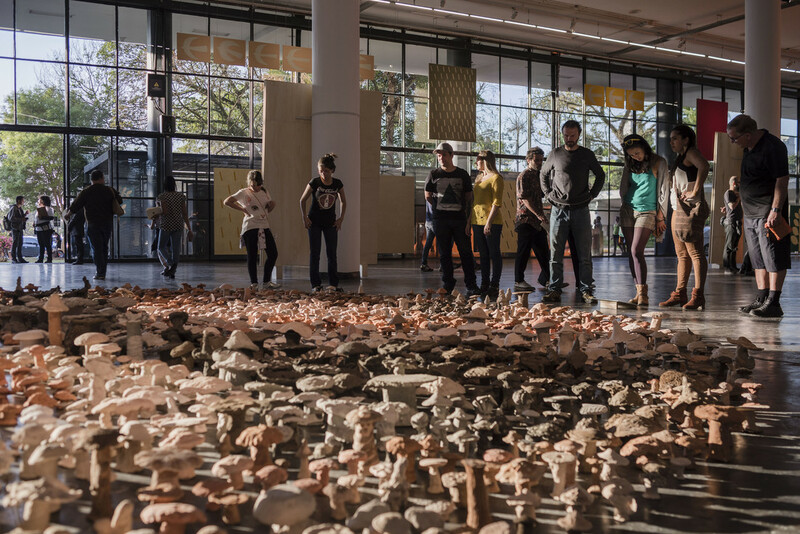 For the curator, these exhibitions also make a significant contribution to the Fundação Bienal in terms of research, cataloging and recovering the production of these artists. Aníbal López (Guatemala City, Guatemala, 1964-2014), also known as A-153167, the number on his ID card, was one of the precursors of performance art in his country. 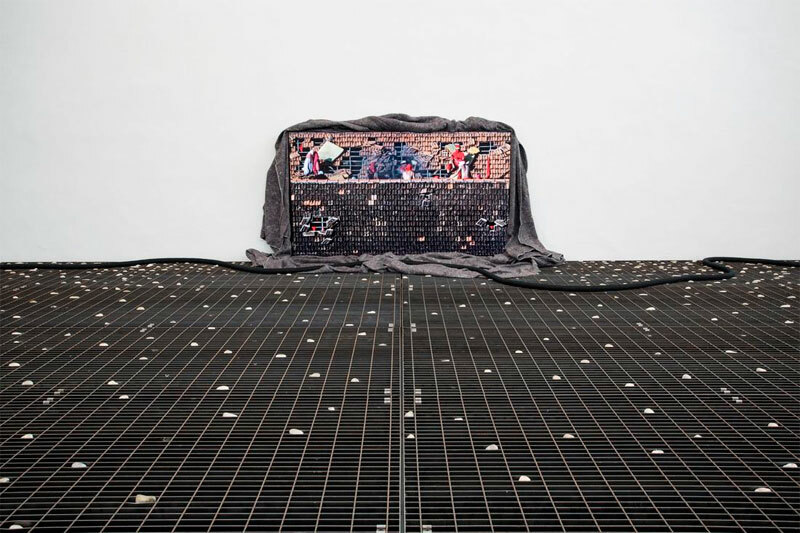 His work, which includes video, performance, and urban interventions, among others, is strongly political and focused on disputes regarding national borders, indigenous cultures, military abuses and even the art market. Videos and photographs of ephemeral actions, conducted as a form of protest to the objectification and fetishizing of art, compose the exhibition. 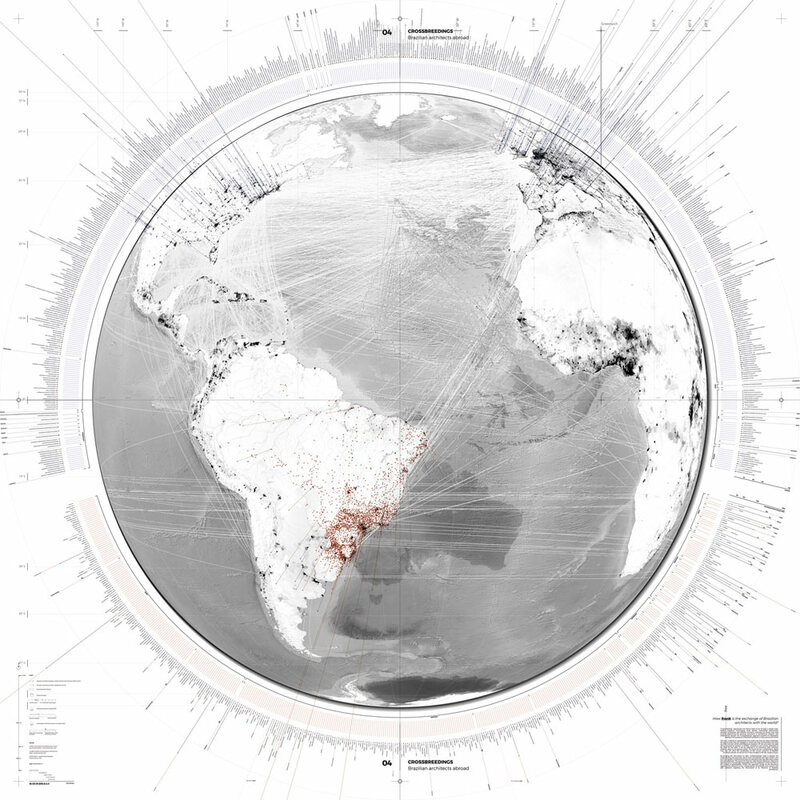 The world of queer art is addressed poetically by Feliciano Centurión (San Ignacio, Paraguay, 1962 – Buenos Aires, Argentina, 1996), who left his country of birth, Paraguay, to live in Argentina, where he became an exponent of the so-called “Rojas” generation (the first artists to show their work at the gallery of the Centro Cultural Rector Ricardo Rojas, at Universidad de Buenos Aires) until he fell victim to AIDS-related complications, at 34 years of age. Centurión worked primarily with fabrics and embroidery, incorporating pieces such as handkerchiefs and crochet purchased in arts and crafts markets in Buenos Aires. Descended from a family of embroiderers, he appropriated craft as an artistic language to express elements of his personal history based on a family tradition common in Paraguayan culture. Still relatively unknown in Brazil, Lucia Nogueira (Goiânia, Brazil, 1950 – London, United Kingdom, 1998) is an essential figure to understand British art of the period, and achieved international recognition in her short life. Her sculptures and installations subvert the utilitarianism of objects with subtle humor, unusual associations between elements, and wordplays in their titles, creating an atmosphere that is both disquieting and poetic. 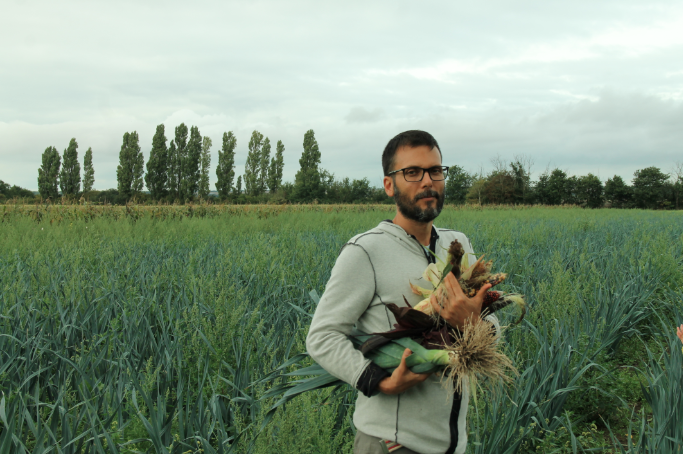 Individual projects from nine artists, of which eight were specially commissioned, complete the selection by Pérez-Barreiro. The only one to exhibit historic work is Siron Franco (Goiás Velho, Brazil, 1950), with the series of paintings Césio/Rua 57. In this series, Franco internalizes the impression of horror and isolation caused by a radiation accident which occurred in 1987 in Bairro Popular, in Goiânia, when a capsule of the radioactive element cesium-137 was accidently uncovered in an x-ray machine that was illegally abandoned in a garbage dump. Born and raised in that neighborhood, the artist returned to his native city shortly after the accident, leaving the Rio-São Paulo axis behind for good. His registers of the environmental catastrophe resulted in a significant turn in his career, which previously favored figurative irony, toward the use of allegory with symbolic elements. The pigment used in some paintings of the series comes from the soil of Goiânia, which many believed to be contaminated by the radioactive substance. Clothes inserted into some of the paintings hint at the four first victims of the accident, one of whom was a child. 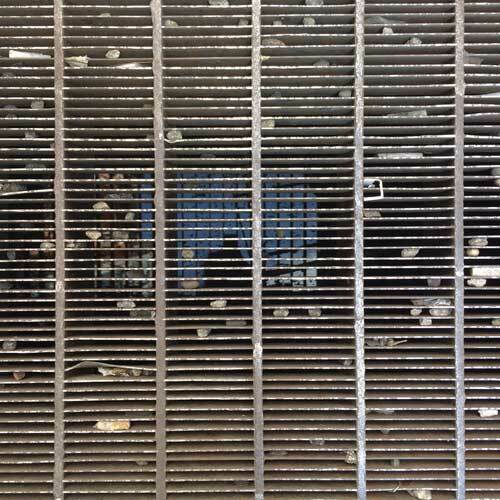 In times of environmental disaster such as the 2015 collapse of the Fundão dam, in Mariana, the debate surrounding the work by Siron Franco remains sadly current. What the eight artists with projects commissioned have in common is that their work does not fit into a thematic structure. “They are complex works that function individually and do not need an additional context for the viewer to relate to them,” explains Pérez-Barreiro. The Buenos Aires native Alejandro Corujeira (Buenos Aires, Argentina, 1961) possesses a formal conception that is light and fluid, which appears to want to capture the movement of nature. New sculptures and paintings will be presented at the exhibition. Denise Milan (São Paulo, Brazil, 1954) creates sculptures and installations with large stones and crystals. At the 33rd Bienal, the artist will exhibit new works using these unusual (for art) materials. Attention to daily life serves as inspiration for the works of Maria Laet (Rio de Janeiro, Brazil, 1982), who will exhibit a new video at the 33rd Bienal, and for Vânia Mignone (Campinas, Brazil, 1967), who will present new paintings. 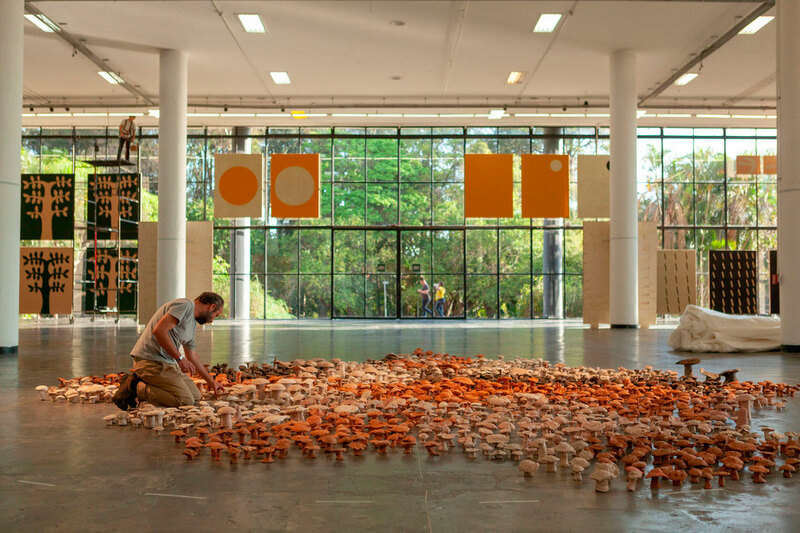 Nelson Felix (Rio de Janeiro, Brazil, 1954), who in his “formal work appears to materialize a planetary awareness,” in the words of Pérez-Barreiro, will present a new sculptural installation. Studies by Bruno Moreschi (Maringá, Brazil, 1982) and Luiza Crosman (Rio de Janeiro, Brazil, 1987) are related to institutional critique and do not use traditional artistic formats. 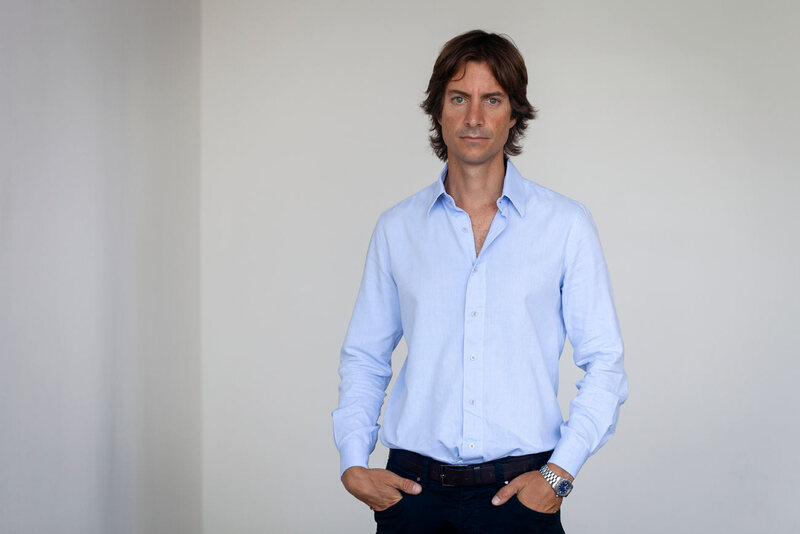 “With these artists we will have, within the exhibition, a critical perspective on how art functions, is exhibited and explained,” affirms Pérez-Barreiro. Based on a personal and poetic approach, Tamar Guimarães (Viçosa, Brazil, 1967), who combines a critical perspective on institutions with poetic and narrative concerns, will present a new video. Together with the announcement of the artists selected by Gabriel Pérez-Barreiro, the 33rd Bienal is launching the poster for this edition, designed by Raul Loureiro, who brought his own affinities as graphic motifs for the visual identity of the exhibition. 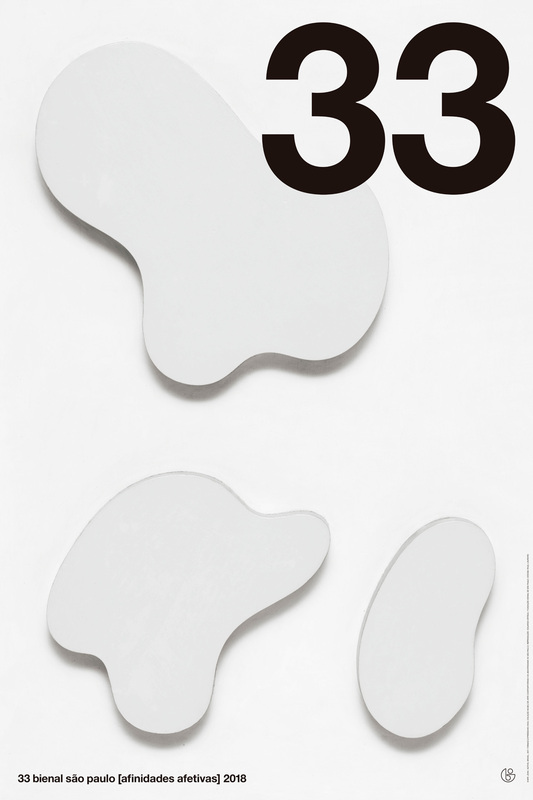 The poster for the exhibition is composed of a reproduction of the work Formas expressivas [Expressive Forms] (1932), by Hans (Jean) Arp – a relief painting with wood –, accompanied by typographic elements. 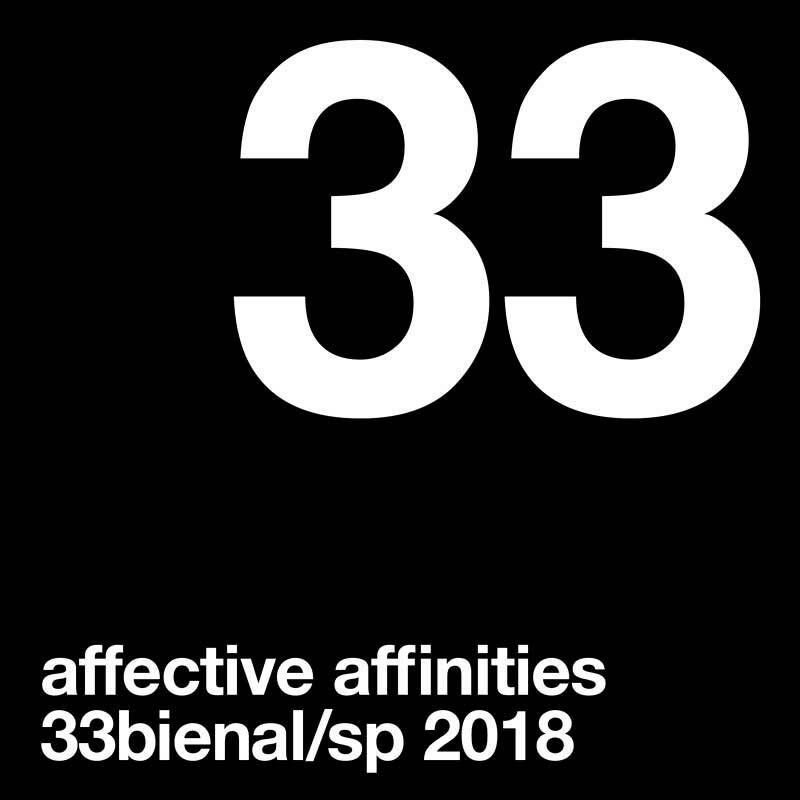 The visual identity adopts the Helvetica font family, which prioritizes clarity and neutrality of meaning, and emphasizes the number 33 as a conceptual element. The 33rd Bienal will also present its educational publication, developed by the team at Fundação Bienal with the education consultants Lilian L’Abbate Kelian and Helena Freire Weffort. Under the title Convite à atenção [Invitation to Attention], the publication addresses the issue of attention by proposing various exercises, which can be done individually or in groups. In an effort to counteract the distractions caused by the immense volume of information and images with which we are bombarded daily, these exercises were created as an invitation to be attentive to the experience of art. The publication, with new collages by the artist-curator Antonio Ballester Moreno, proposes a set of experiences whose use is not restricted to the 33rd Bienal, but, rather, applicable to many works and contexts.